Fast and slow, when referencing carbohydrates, refers to the speed at which carbohydrates are digested and converted into glucose. This is important for many reasons. For example, slowly-digested and rapidly-digested carbohydrates have different effects on your blood insulin and glucose levels. This has ramifications for your appetite and body weight management, as well as your body’s control over blood fats such as triglycerides. Broadly speaking, slowly-digested carbohydrates are more desirable than rapidly-digested carbohydrates for good health. Carbohydrates are officially categorized as simple and complex. The primary basic building block of all carbohydrates is the simple sugar molecule glucose. Simple carbohydrates are relatively short chains of glucose that may contain fructose and galactose. Complex carbohydrates are more intricate, spiraled, coiled and branched -- and they contain a lot more glucose than simple carbohydrates. All carbohydrates get broken down into individual sugar molecules, mainly glucose, in your digestive tract. The glucose is then absorbed and provides energy for your cells. Simple carbohydrates such as sucrose, or table sugar, and carbohydrate-rich foods containing refined grain flours are relatively easy to digest. Examples of fast-digesting carbohydrates include white bread, corn flakes, candies, soft drinks and other highly processed foods, along with honey and some fruits. Unprocessed complex carbohydrates, because of their complicated and nuanced chemical structure, tend to take longer to break down into blood glucose. Therefore, they are said to be slow-digesting carbohydrates. 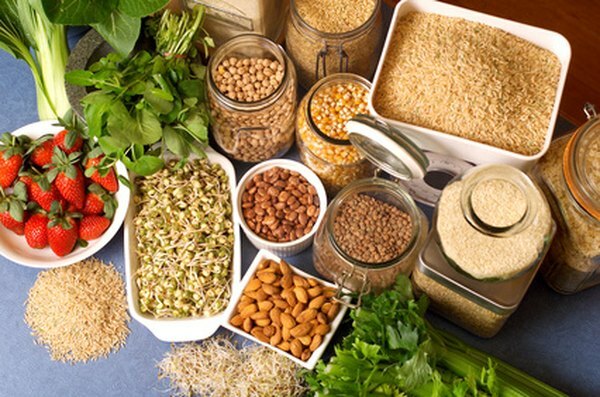 Examples of foods containing slow-digesting carbohydrates include whole grains and whole-grain products, beans, lentils, peas and sweet potatoes. Your pancreas secretes a hormone called insulin in response to the glucose that enters your blood from the small intestine. The primary job of insulin is to facilitate glucose movement from your blood into your cells. However, insulin has a host of other functions, including fat production, that you need to be mindful of. When you eat fast-digesting carbohydrates, you are potentially spiking your blood glucose and insulin levels. David Ludwig, a pediatric endocrinologist, reported in Harvard Medical School’s “Focus” newsletter that rapid increases in blood glucose cause insulin to stimulate your body to make more fat, which sets the stage for developing insulin resistance and Type 2 diabetes. The 2010 Dietary Guidelines for Americans recommends that most healthy people should eat between 45 and 65 percent of their total daily calories as carbohydrates, preferably from slow-digesting carbohydrate sources. Natural, unprocessed slow-digesting carbohydrates also provide important nutrients. Too often, however, Americans consume fast-digesting carbohydrates in the form of refined flour products such as pizza, pastries, desserts and sugary drinks. In addition to provoking weight gain and abdominal fat, fast-digesting carbohydrates can produce intense food cravings because they lack essential nutrients. Why Does Your Body Turn to Protein or Fat for Energy if You Don't Get Enough Carbohydrates?